Stand-up	Chris on	Hello and welcome to our round-up of the European Parliament's latest plenary session in Strasbourg. This week, Greece presented plans for its rotating presidency of the EU. 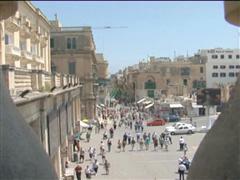 There were resolutions about migration, and on Malta's controversial citizenship program. And there was debate on whether to scrap an EU-US data protection agreement. We begin with Greece, which this month took the helm of the rotating presidency of the European Union. Chris off	For the first half of this year, Greece leads the European Union, at a time of fragile and gradual economic recovery. How to generate more jobs, especially among youth, is the top priority. A so-called Compact for Growth and Jobs is aimed at pushing through reforms and boosting investment programs, including through the European Investment Bank. To strike a better balance between boosting the economy and getting budgets under control. Chris off	Prime Minister Antonis Samaras, a member of the EPP family, told the Parliament…. Samaras continued, in English	Remember the example of my country. Greece suffered and still suffers; but we are now standing on our feet, we are proud, we are holding our ground, we are returning to normality and by doing so, we prove to everyone that Europe works, that Europe can make it. By defending our destiny as a nation, we also defended the future of Europe, in every step of the way. Chris off	EPP Group President Joseph Daul says Greece's leading priorities for its presidency can speed the recovery. Monsieur premier ministre, j´admire votre détermination. Vous tenez le cap, en gardant les espoirs. Les chiffres vous montrent que vous êtes sur la bonne voie. Votre pays est à l´equilibre primaire. Bravo. Mais cela ne suffit pas. Maintenant, il faut qu´il y ait un deuxième point qui soit lancé. Et quand j´étais la dernière fois en Grèce, et ça compte pour toute l´Europe. Au niveau des jeunes, au niveau des entreprises, nous avons le devoir de démontrer que la aussi nous sommes capables. Chris off	Also on Greece's to-do list: further integration of the EU-Eurozone. As a first step, the Greek Presidency will strive for concrete progress on banking union, including the Single Resolution Mechanism. An EU-wide approach to tackling bank failures is an important step to preventing another financial crisis. Chris off	On the frontline of refugee flows into the EU, Greece also wants to tackle migration, borders and mobility. It wants a comprehensive EU-wide system to manage migration flows. Linked to that, it wants to boost EU maritime security. Chris off	More on migration: the end of restrictions on Romanians and Bulgarians this year sparked fear in some EU countries of a wave of migration from east to west. To counter what some call populist fear-mongering, the European Parliament approved a resolution on freedom of movement across the EU. Chris off	The resolution calls on all member states to respect free movement as one of the EU treaty's fundamental rights. It says the European Commission and the EU28 should ensure that all EU workers are treated equally, to protect against discrimination. Chris off	It reminds member states of their responsibility to tackle misuse of their social welfare systems, whether by their or other EU citizens. Some EU member states have taken or are considering taking, action to restrict benefits for migrants. Chris off	Marian-Jean Marinescu is an EPP Group Vice-President from Romania. The social benefit is depending on the national law. So in my opinion there are very populistic approaches not based on the real situation. Chris on	The parliamentary action came as the European Commission published guidelines on migration, aimed at defusing the debate. EU employment Commissioner Laszlo Andor says debate in some member states is "emotional and misguided." Mr. Marinescu agrees. Chris off	Supporting that, a new study by a Swedish economist finds that Bulgarian and Romanian migrants bring 30% more to the Swedish state in tax revenue than they cost. Chris off	Next, the controversy over Malta's policy of granting EU citizenship to wealthy individuals. The Socialist-led government there wants to raise a billion euros by granting citizenship to those who invest, and pay, more than a million euros each. That's sparked outrage in the European Parliament. Chris off	It's Malta's controversial way to raise money. The so-called Individual Investor Programme requires an applicant to pay 650,000 euros to the National Development and Social Fund, and buy 350,000 euros in property, 150,000 in government stocks. Family members an additional 25,000 euros each. The national fund is for research, education, job-creation and other programs. Chris off	Never mind what the money goes for, say MEPs. It still comes down to citizenship for sale, and passed a resolution against it. Roberta Metsola is an EPP Group MEP from Malta. The resolution is very strong. It sends an extremely strong message to the Maltese government that there is something wrong with the scheme it has proposed. The Parliament has spoken, and even though citizenship falls within the exclusive competence of member states, the impact of such a scheme on the EU is huge. And therefore the Maltese government had better pay heed to what the European Parliament has told it. Chris off	The EPP Group's motion for a resolution says Malta's program "undermines the very concept of European citizenship." It calls on the European Commission to clearly state whether the scheme respects EU treaties or not. Chris off	It also says the rights from EU citizenship are based on human dignity and "should not be bought or sold at any price." It calls on Malta to bring its citizenship scheme "in line with the spirit of the EU's values." Chris off	Finally, data protection. The Prism spying scandal that embroiled US intelligence agencies has prompted calls to scrap the so-called Safe Harbour agreement between the EU and the United States that allows the exchange of data. The EPP Group is cautioning against throwing out all data-sharing agreements. It says Europe´s security is at stake. Chris off	Uncovering the US mass surveillance Prism program caused widespread anger in the European Union, and debate over all cross-Atlantic data exchange. First in the line of fire: the Safe Harbour agreement allowing US companies to process personal data of European citizens. We are discussing currently in the European parliament about new European data protection standards, very strong standards to protect our citizens. And if we want to give these new criteria, these really strong power, then we must stop the safe harbour agreement. Chris off	But Weber says that in ordert to fight terrorism, we need to maintain agreements on Passenger Name Records, or PNR, and on the Swift banking data system. Chris off	The next step: renegotiate the Safe Harbour agreement, to ensure Europeans' privacy but also to facilitate trade between the world's two largest econonomies. Headline	Jobs are priority for Greek presidency - European Parliament acts on migration, Maltese citizenship, and data protection. Description	The latest European Parliament plenary in Strasbourg hears the Greek presidency´s plans to focus on job-creation, banking union and orderly migration. The Parliament approves resolutions supporting free movement, amid debate over lifting restrictions on Bulgarians and Romanians. One resolution calls on Malta to stop selling EU citizenship. EU-US data protection agreement comes under scrutiny, EPP urges defending passenger and banking data agreements to fight terrorism.